Roger Federer sent a warning to his title rivals at The Championships on Monday when he reached the Wimbledon quarter-finals for the 16th time. The eight-time champion competed with great fluency and was a continual threat to French No. 22 seed Adrian Mannarino in a 6-0, 7-5, 6-4 victory on Centre Court. 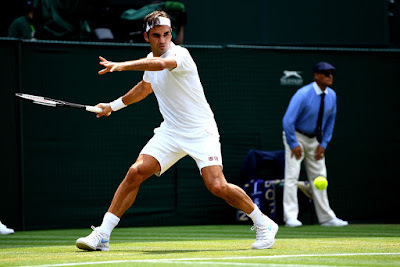 Federer has now won 32 consecutive sets at Wimbledon - only two sets shy of his record 34 sets won between 2005 - 06 - and held serve 81 times in a row. He will next prepare to challenge eighth-seeded South African Kevin Anderson, who defeated Gael Monfils of France 7-6 (4), 7-6 (2), 5-7, 7-6 (4). He leads Anderson 4-0 in their ATP Head to Head series, but the pair has not met since August 2015 at the Western and Southern Open. 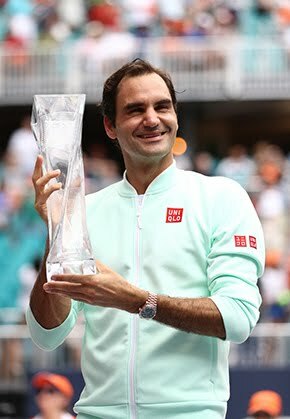 Prior to The Championships this year, Federer captured the 98th trophy of his career at the MercedesCup (d. Raonic) and finished runner-up at the Gerry Weber Open (l. to Coric). 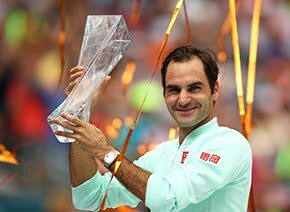 He has a 28-3 record on the season, which also includes his 20th major crown at the Australian Open (d. Cilic) and his third at the ABN Amro World Tennis Tournament (d. Dimitrov). Mannarino was unable to find his rhythm in the first set, unsure of his ball striking, movement and positioning with Federer winning 25 of the 30 points in the 16-minute passage of play. Errors by Mannarino on two backhands and one forehand handed Federer a 5-0 lead, with the Swiss sealing the set when Mannarino hit a lob long. Federer, who had not faced a break point in three previous matches in the first week, saved one break point opportunity for Mannarino at 5-0, 30/40 with an ace. It came as a relief to both Mannarino and the capacity Centre Court crowd, when the Frenchmen saved three break points and held serve in the opening game of the second set. It wasn’t until Mannarino’s eighth service game that Federer did not create a break point chance, and slowly the 30-year-old grew in confidence - striking one backhand winner at 80 miles per hour in the 10th game. Nerves played their part at 5-5, when Mannarino became hesitant on his forehand and Federer took advantage. Mannarino came within one point of taking a 5-3 lead - on three occasions - in the third set, but a forehand winner from Federer, then two backhand errors gave the Swiss a reprieve. It sparked the top seed into life as he broke Mannarino in the next game en route to his 95th match win at the All England Club (95-11) over one hour and 45 minutes. “I was just trying to do as well as I could, but he was too good,” said Mannarino, who was playing on Centre Court for the fourth time. “Against Federer you have to play really well from the beginning. The last time we played each other [in the 2017 Swiss Indoors Basel quarter-finals], I won the first set. The 30-year-old Mannarino is now 18-18 on the year, which includes his second straight final appearance at the Turkish Airlines Open Antalya (l. to Dzumhur), two days prior to the start of Wimbledon.